Workshop #10: Bandsaw works great!! So in my last blog I noted that I have added a bandsaw to my arsenal of tools. It was a great deal and needed a new blade and some quick cleaning up. Well I went and got a blade yesterday and cleaned up the saw and installed the new blade today. Then I just played around a bit. Here are the two projects I did in order to play around some and get familiar with the tool. I decided I would just post them here and not as an actual project, maybe I’ll have something by the end of the weekend to post. 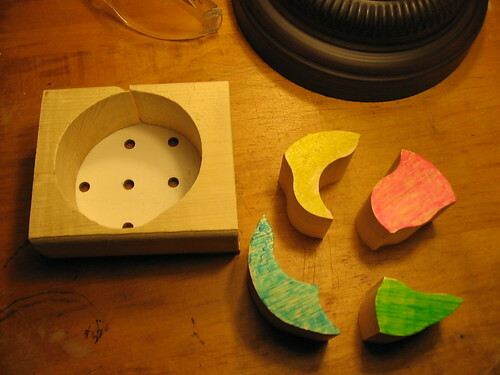 A puzzle, just wanted to play with making different shapes.The bottom is just a piece of scrap pegboard glued on. I got bored later and colored in the pieces using highlighters that were sitting my desk. This is a box similiar to the anniversary box made but I took a thin piece off of each end and then cut out the middle before gluing the bottom back on and drilling a hinge hole for the lid. 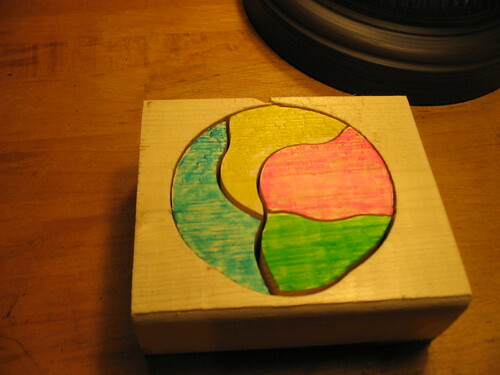 I really am looking forward to trying my hand at a real bandsaw box at some point soon. Both of these were of course made from 2×4 scrap. I had fun and am looking forward to much more soon. Happy Halloween to you all and thanks for looking. Hey Chris, you’ll love having the band saw I use mine a lot. Do you know what size blades your saw takes? I think I still have a couple 93 1/2” blades hanging around I can’t use. 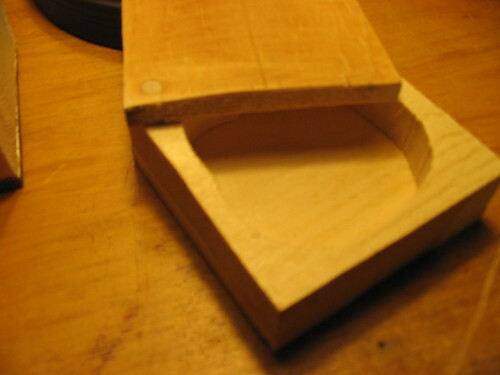 Anyway, great box and puzzles having a band saw opens up a whole new realm of possibilities and makes a lot of the little tedious jobs in other projects a lot easier and faster. Congrats! Thanks all, I am so looking forward to other projects. DB does the picture have to be of anything? Course you could always just print out a picture and put it on a plywood back and just cut it out in odd pieces.. Hmm I think I just gave myself an idea for a gift.